MUZAFFARGARH: Workers of Pakistan Tehreek-e-Insaf (PTI) on Tuesday protested against the alleged seat adjustment with Awami Raj Party leader Jamshed Dasti. The workers took to streets in the Sanawan area of the city after reports surfaced of PTI not fielding a candidate from NA-182 and instead supporting Dasti in the constituency. 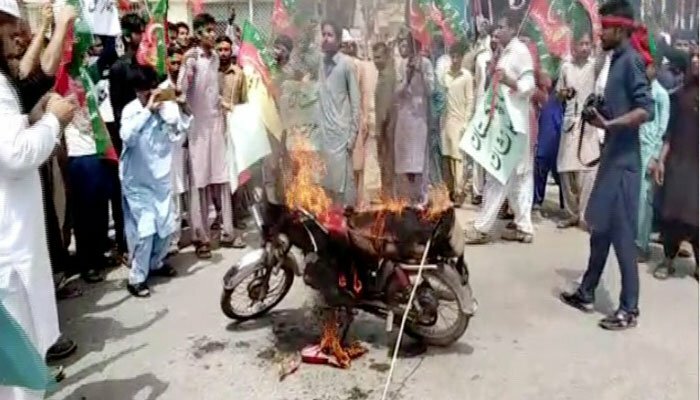 The agitated workers carried out a demonstration at Mehmood Kot Chowk, which falls under NA-183 and set ablaze motorbikes to protest the party leadership’s alleged decision. They said that PTI had been struggling to eradicate corruption from the system, therefore, should not support a politician who was accused of carrying out illegal practices. On Monday, the party workers protested in NA-182 constituency of Muzaffargarh, ransacking PTI District Secretariat. They barged into the office and broke furniture, windowpanes, also burnt tyres while blocking the road. However, since PTI is divided into two groups over the matter of seat adjustment with Dasti, the faction supporting the Awami Raj Party leader carried out a rally in his favour. The PTI workers who supported Dasti said they were in favour of the party’s decision and were of the view that an action should be taken against those who damaged property in the District Secretariat on Monday. PTI’s support for Dasti has been witnessed earlier, when he was jailed for forcibly opening a canal gate in Muzaffargarh on May 28. Dasti was put behind bars after he irrigation department lodged a case against him. Subsequently, PTI’s legal team headed by lawyer Shahid Gondal recorded Dasti’s statement and announced to submit a bail petition on his behalf.